2014 has heralded what seems to be a reawakening of potential in international art biennials. From Istanbul to Sydney and Saint Petersburg to São Paulo, an exhibition form that was threatening to slide into neoliberal conformism has again become the site of conflict and controversy. While the dilemmas of each biennial have their own origins, these developments will, in general, bring a renewed engagement in the symbolic value of biennials and the ways they can be contested in public. It is in this spirit of questioning and provoking the concept of the biennial form, that the World Biennial Forum No 2 has been assembled. The World Biennial Forum No 2 will look at the biennial from the point of view of the southern hemisphere. It will concentrate above all on recent biennials in what has come to be termed the ‘Global South’, occasionally taking a broader perspective to investigate how we have arrived here. The main focus will be on the cities of Dakar, Istanbul, Jakarta and São Paulo, where the Forum takes place, but also other southern biennials will come into the picture. The four focus cities have been staging biennials in different forms over at least the past 20 years, during which time they have invented new traditions and created suitable structures to support and develop them. At a time when the relationship between artistic desire and political will is under negotiation more broadly and biennials are seen simultaneously as both opportunities for harvesting cultural capital and threats to the smooth operation of the status quo, these biennials will serve as the anchor points for a more general discussion about what the potential of biennials is in contemporary times. 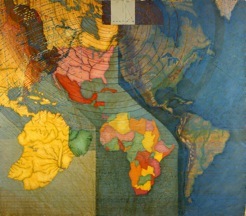 Image credit: Juan Downey, Mapa Mundi, 1979. Oil on linen. 180 x 205. Photo: Harry Shunk. Courtesy of Marilys Belt Downey, The Juan Downey Estate. 10 a.m. – 11 a.m. – Introduction by the curators to the 31st São Paulo Biennial. Venue: Biennial Pavilion. 11 a.m. – 4 p.m. – Visit to the 31st Biennial. 11 a.m. – Visit to the Pinacoteca do Estado de São Paulo. Taking the idea of the ‘Global South’ as a starting point, a term we understand as one that is still in the process of definition, the World Biennial Forum No 2 will look at how this geography shapes the current condition of world biennials. What pitfalls and possibilities might southern biennials present for biennial cultures in (sometimes desperate) need of renovation? What happens to the form of the biennial when biennials become part of a world system of art institutions subject to a global temporality? Can a biennial occur as the expression of a common will, or as a desire for the formation of a public sphere? Who are biennials organized for? And does love have anything to do with it? These are some of the questions the World Biennial Forum No 2 will pose. Image Credit: 31st Bienal. Sofia Colucci, Fundação Bienal de São Paulo. On both days of the Forum, workshops will take place, moderated by the artistic directors. In these workshops (closed to the audience), biennial representatives and invited professionals engaged with biennial politics will discuss issues closely related to the Forum’s themes. Invited respondents to the Workshops on Biennial Practice: Koyo Kouoh, Azar Mahmoudian, Combiz Mousavi Aghdam, Patrick Mudekereza, Yvette Mutumba, Ugochukwu-Smooth C. Nzewi, Eva Scharrer, Alya Sebti, and Suzana Sousa. The first dayʼs workshops will focus on how biennial histories are accounted for and preserved. Once Again, as If for the First Time will look at biennial institutions as a whole, discussing how they both reproduce themselves and radically change over time. Works and Their Changing Places will discuss particular artworks and their appearance in different biennial contexts. The second day will look broadly at the question of how a public is constructed through biennials, while considering the different criteria for what a public is. To this end, No More Imagined Communities will focus on the emergence of new biennials in the Global South, while Popularity without Populism will look at specific public and educational ambitions. The 31st Bienal de São Paulo is curated by Charles Esche, Galit Eilat, Nuria Enguita Mayo, Pablo Lafuente, Luiza Proença, Oren Sagiv, and Benjamin Seroussi. The title – How to (…) Things that Don’t Exist is a poetic invocation of art’s ability to create new objects, thoughts and possibilities. The sentence has a variable formula that constantly changes, anticipating the actions that might make present in contemporary life the things that don’t exist, are not recognized, or have not yet been invented. With 81 projects and more than 100 participants from 34 countries, totaling around 250 artworks on display, the exhibition has been conceived as a journey through the Pavilion divided into three different areas: park area, ramp area and columns area. Along the journey, visitors will encounter projects that are grounded in contemporary life and particularly touch on aspects of religion, social conflict, sexuality, ecology, and identity. In the 31st Bienal de São Paulo, we have tried to bring together artists that tackle the complexities of today when the end of the modern meets the still uncertain beginnings of a new system of thinking, suggests the curatorial team. More than half the projects have been made specifically for the exhibition, many by international artists who have produced work in response to a residency in the city and the opportunity to travel further in Brazil.